Build management: Maven, Maven EJB Plugin and others ..
We’re too lazy to create a project skeleton and add dependencies by hand so we’re using an archetype to create our project.. Create an empty file named beans.xml in src/main/webapp/WEB-INF – we need it for CDI .. you’re asking why? Gavin King kindly gives an explaination. We want to save our blog entries in the persistence layer .. what we’re going to store is a title, the author, the date the entry was created and of course some text content. Now we need to define a persistence unit ..
At last we want EclipseLink to create the tables for our entity so the value for the property eclipselink.ddl-generation is “create-tables“. You might want to change this for another persistence unit for integration tests later. Now that we have defined our entities and persistence unit we should add some validation rules not to allow to save invalid blog entries. The rules that we’re going to define are ..
We’re going to use a stateless session bean to provide methods to save, delete and list our blog entry entities. We don’t define any local or remote interfaces to keep it simple here. First we’re creating some facelets and decorators .. to keep this example simple we’re only creating a view to create new blog entries and a view that lists existing entries. Please note that we’re using CDI for dependency injection here – that means @Named instead of @ManagedBean, @Inject instead of @EJB and javax.enterprise.context.RequestScoped instead of javax.faces.bean.RequestScoped!! In the next step we should add some i18n and move our messages and text content to a resource bundle so create a directory src/main/resources/com/hascode/tutorial/jee6/blog and a new file named messages.properties in this directory. We could have managed our user actions completely using nice PrimeFaces AJAX-enriched components or JSF’s native AJAX API but to demonstrate JSF’s navigation rules we’re going to define a new view with a form to create a new blog entry. If the blog entry has been successfully saved using this form we want to redirect our user to the entries-list-overview and the URL should change to avoid posting duplicate content by refreshing in the browser. The GlassFish setup is quite easy we simply need a new domain and the embedded database because we’re too lazy to connect or create an external database ..
Domain blog-domain admin port is 4848. Domain blog-domain allows admin login as user "admin" with no password. “PrimeFaces is not defined“: There was an issue with some menu components in PrimeFaces 2.2.RC1, Cagatay Civici has already fixed this one in version 2.2.RC2 and above. “Duplicate menuitem in contextmenu“: Again Cagatay Civici saved the day and fixed this issue, update to version 2.2-SNAPSHOT or above. Gavin King: Why is beans.xml required in CDI? 2015-03-21: Links to my Arquillian articles added, formatting fixed. This entry was posted on Tuesday, February 8th, 2011 at 9:35 pm	and is filed under Java. You can follow any responses to this entry through the RSS 2.0 feed. You can skip to the end and leave a response. Pinging is currently not allowed. Simple, to the point and complete. Excellent tutorial. I followed along building the application in Eclipse with GlassFish v3 as the server and everything worked perfectly. 1. Is EclipseLink/TopLink built-in to GlassFish v3? I don’t see it listed in the pom’s dependencies. 2. What’s the purpose of endorseddirs in your pom.xml? Is that needed to build this application? I’ve not seen endorseddirs before in Java EE 6 app’s pom.xml. I’ve just completed and it works. I personally learned a lot from it. I still need to review some concepts, but thank you for a complete tutorial. Sorry, It works fine, I forgot it works by clicking the right button. Wonderful, no-nonsense tutorial, Micha. Thanks. Your tutorial is the best so far on the Internet. Is this an issue only with OpenJPA and not EclipseLink? What can I do to resolve the missing libraries? Please help. Thanks, Micha. Much appreciated. You save me a couple of hours floundering on Google trying to find the right library for the unresolved classes. Is this another way one can configure EJB + Entity for CRUD operation? Or, is this a BAD (and possibly, not recommended) way of doing it? Can you please confirm. Thank you. Thanks, Micha. That article make sense and it answers my question above about NameQuery/NameQueries defined in Entity class. Tried the above codes – everything good – except that this EL expression blogEntryBean.getBlogEntries() in list.xhtml will be executed 6 times for each phase of the JSF lifecycle. The above demo works great except that blogEntryBean.getBlogEntries() in list.xhtml will be called 6 times for each phase of the JSF lifecycle. Yeah, I’m not sure either! Debugging the codes revealed that the method got called 6 times – which to my knowledge – corresponded to the phases of the JSF lifecycle. I tried both blogEntryBean.getBlogEntries() and blogEntryBean.blogEntries and I got the same result. Hi from Russia! Thanks for great tutorial! But one question, because i cant find it by google. How can i use JSF with JAX-WS client? i want to display a table by jsf. In JAX-ws class i have a method “findall” and “find”, what returns all data and other one entry. Please tell me in common words what i must do. Thanks!!! Nice tutorial, however some missing points make it hard to adapt for a real application. First, you should add a count() method to BlogEntryEJB and BlogEntryBean. Using blogEntryBean.getBlogEntries().size() will read ALL blog entries from database, which is not what you want. What could make a difference from all other JSF CRUD tutorials is adding pagination support on the server side. While this is one of the most important aspect of a CRUD application, it can be quite a challenger to achieve in JSF application without using @SessionScoped beans – using flash scope parameters, page parameters and post-redirect-get. Even NetBeans CRUD page generation wizard is not usable. Otherwise, nice explanations and screenshots! javax.validation.ConstraintViolationException: Bean Validation constraint(s) violated while executing Automatic Bean Validation on callback event:’prePersist’. Please refer to embedded ConstraintViolations for details. > While this is one of the most important aspect of a CRUD application, it can be quite a challenger to achieve in JSF application without using @SessionScoped beans – using flash scope parameters, page parameters and post-redirect-get. @ViewScoped is the most natural fit here. But still problem 1 regarding Plugin execution, persist. thanks for your note – I have updated the location of the primefaces maven repo to the new address. The lifecycle error is one of the “features” of the new Sonatype m2eclipse Plugin – they’ve written this article to explain why this problem exists. Afterwards you should be able to compile the application without any problems .. Thanks Micha the plugin problem is fixed. The tutorial helped me alot to kick start me. Here you explained to use external glassfish. Is there a way to use the glassfish from eclipse itself and it does every thing for me. With this it will re-deploy all changes immediately. Hi Micha, One more thing, I am not able to download sources for javax javaee-web-api 6.0? No the sources are not present there. ah the sources .. I havent found a repository for this one yet so a possible (annoying) workaround is to download the sources from here and run something like this mvn install:install-file -Dfile=javadoc-6.0.1.jar -DgroupId=javax -DartifactId=javaee-web-api -Dversion=6.0 -Dpackaging=jar -Dclassifier=javadoc .. the project might be re-imported afterwards depending on the eclipse/maven plugin used ..
Error occurred during deployment: Exception while loading the app : java.lang.IllegalStateException: ContainerBase.addChild: start: org.apache.catalina.LifecycleException: java.lang.IllegalArgumentException: javax.servlet.ServletException: com.sun.enterprise.container.common.spi.util.InjectionException: Error creating managed object for class org.jboss.weld.servlet.WeldListener. Please see server.log for more details. hi, awsome tutorial for a jee6 starter. After searching a lot, i couldn’t solve it. if you got any idea i’ll really apreciate that. thanks! do you have some more information – e.g. a more detailed stack trace? have you modified the code from the tutorial somehow .. e.g. mixed @NotNull and @Id or something like that? You might try to catch the exception and call getConstraintViolations() on it to find out which constraints were violated. I’ve tested the tutorial code against the latest GlassFish version just to be sure it works. about annotations: i changed stuff but only packages, and i18n stuff. not touched the entity anotations. the values of the object where null. almost all of them, except for the time stamp. going backwards, found that the values are never getting in the JSF bean. So when it arrives to the ejb, is empty. nevermind. my mistake there was that had imported the wrong annotation. @named > @request ( the enterprise context request, not the faces context). after that i got an error on the @past, cannot solve it so removing it it worked fine. thnx again for such a great introduction. may be updating this tutorial will be nice :). Great. This is a very informative tutorial. I do have one question however. I have noticed many tutorials where they use dependency injection to inject an entity (BlogEntry) into the controller/backing bean. Does this violate separation of concerns? Is it just the responsibility of the programmer to use the entity in the controller in a way that does not violate separation of concerns or am I just totally confused. Thanks. Hi, sorry to hear that .. which glassfish version are you using here? you’re just building the blog application with maven, you’re uploading it in the glassfish web adminstration panel as a web application and this exception is thrown? Hi, is this persistence unit defined in your persistence.xml? 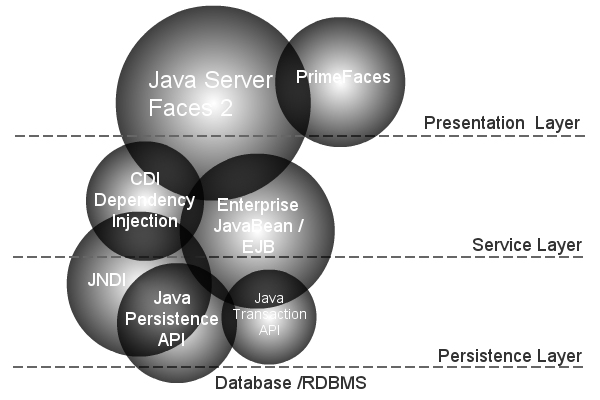 and does the jta datasource named “jdbc/__default” exist on your GlassFish configuration? did you start the embedded database via “asadmin” and “start-database”? Youssef: works for me on gf 3.1.2 .. your problem sounds like a gf problem for me .. any special configuration here? Erreur lors du déploiement : Exception while preparing the app : Exception [EclipseLink-4002] (Eclipse Persistence Services – 2.3.2.v20111125-r10461): org.eclipse.persistence.exceptions.DatabaseException Internal Exception: java.sql.SQLException: Erreur lors de l’allocation d’une connexion. Cause : Connection could not be allocated because: java.net.ConnectException : l’erreur lors de la connexion au serveur localhost sur le port 1527 a émis le message Connection refused: connect. Error Code: 0. Pour plus d’informations, consultez le fichier server.log. Exception while preparing the app : Exception [EclipseLink-4002] (Eclipse Persistence Services – 2.3.2.v20111125-r10461): org.eclipse.persistence.exceptions.DatabaseException Internal Exception: java.sql.SQLException: Erreur lors de l’allocation d’une connexion. Cause : Connection could not be allocated because: java.net.ConnectException : l’erreur lors de la connexion au serveur localhost sur le port 1527 a émis le message Connection refused: connect. seems like you’re not able to connect to the database .. any hint in your database logs in /path/to/glassfish3-installation/glassfish/databases/derby.log? are you able to directly connect to the derby database using ij or another tool? is there something in your environment that blocks a connection – e.g. firewall or stuff like that? So, i don’t know why for the first time i created an article, i didn’t have this error ! Great tutorial. One question. You have shown how to perform CRD of CRUD. Can you show us how to do updates using JSF 2 + JPA? but into the create.xhtnl the it is not faound . Great! works fine on Glassfish 3.1.2.2! I’m gonna integrate it as a blog in my webapp , which works with primefaces already. Great job man! Fantastic entry to refresh ideas. could you post some more details about the error – e.g. an excerpt from your server.log? could you please post the complete stack trace? Caused by: javax.persistence.PersistenceException: org.hibernate.exception.GenericJDBCException: Les Large Objects ne devraient pas être utilisés en mode auto-commit. Caused by: org.hibernate.exception.GenericJDBCException: Les Large Objects ne devraient pas être utilisés en mode auto-commit. Caused by: org.postgresql.util.PSQLException: Les Large Objects ne devraient pas être utilisés en mode auto-commit. i’m using JBoss as 7 server and maven3. its works well now! ijust removed @Lob in my entity class. thanks again! I was using your tutorial to create my own PrimeFaces application (jboss 7, Eclipse) and I had some problems with components that were not rendered until I substituted xmlns:p=”http://primefaces.prime.com.tr/ui” with xmlns:p=”http://primefaces.org/ui”. Eclipse also started autocompleting the tags after the substitution. thanks for your remark! The namespace has changed a few years ago and I’ve not updated all of my primefaces tutorials yet. Thank you so much for this very clear article. If the server or listener is not running, the link may not work. In this event, check the status of the server instance. After launching the web application, use the browser’s Back button to return to this screen.”"
by chance i found the problem and i fixed it. i have another problem, the famous HTTP STATUS 404 => the requested resource in not available. i don’t know what to do, and i’m stuck, so can you please help me . To reproduce your problem: Did you create your own Java EE application in a similar way as in the tutorial? Or did you download the sources, built the project using Maven, configured the GlassFish and having deployed the war file you’re not able to open the application in your browser? =>all my xhtml pages (create, list and decorator) are in the web content. i didn’t create the project on maven commadn,on eclipse i started by creating a dynamic project than i convert it to a maven project, after that i added the dependacies, than i deployed it on the glassfish, after creating a pool connexion and a data source. i checked every thing in the properties of the project and it seems that everything is ok.
the only thing that i found realy bizzare is that, when i lunch the project from glassfish, i don’t have directly the create.xhtml page, i have to clic on a link http://name-pc:8080/create.xhtml, and then i have the page!!! i realy appreciate the fact that you answer all my question, i have this last one (i sorry :(). do i have to change in the create, list.xhtml pages the #i18n with msg??? when i try to do this it doesn’t work ????? => when i lunch the page i have the structure as in the video, but no title, and sub titles like (author, content). what can cause this problem. If you can’t resolve the resouce bundle, please verify your war-file if it contains the properties file in the right place – as described above and with the base-name com.hascode.tutorial.jee6.blog.messages, my war file contains a file named messages.properties in WEB-INF/classes/com.hascode.tutorial.jee6.blog. Can never thank you enough. Thanks. Thank you for such a good example for the beginners. I have developed a multi module maven project based on your sample and now i am trying to add the logging for it, could you please try to tell me how to do it as i am unable to understand where to configure the properties file and so on. One more doubt in the existing project is that if i wanted to use the derby out side of the glass fish how should i do it. if you’d like to use an external database, simply configure it in the application container configuration by adding a new JDBC connection pool exporting a JNDI name and use this reference in your persistence.xml. For the logging – do you use the juli logger here? the blogEntry is null and can not save in the database please help me. Thank you for the example but when i fill out the create.xml form and send for save the blogEntry is null and could not save in the database. i can not create new artile in the create page some body can help me.when i send the argument th blogEntry is null. are you using the same setup as in this article? Any exception/stracktrace logged? yes,when i fill out the create form and send the data to the bean the blogEntry is null.